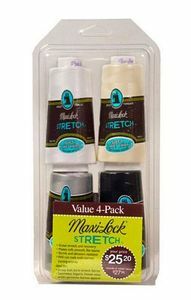 Maxi-Lock Value Pack, Stretch Basics. 3,000 yards per cone. Includes one each of White, Black, Eggshell and Light Grey. MaxiLock Stretch thread in a Serger. Demonstration of serging with MaxiLock Stretch thread. It's only in the lower looper, so that the seam still has some stability. If you are sewing swimwear or gymnastics outfits you would use it in both loopers. More stretchy Maxi Lock Wooly threads below is a different product: Generally, refers to a textured sewing thread like A&E Wildcat Plus® or Best Stretch® that is sewn on overedge and coverstitch operations. Textured sewing threads provide excellent seam coverage and seam elasticity when sewing knits. Like Maxi Lock Stretch, YLI Woolly Nylon Thread is anything but ordinary. Excellent for both the upper and lower loopers of your serger, Original Woolly Nylon is perfect for rolled hems and edges, ruffles, swimwear, aerobic wear, kids clothes, knits and lingerie. 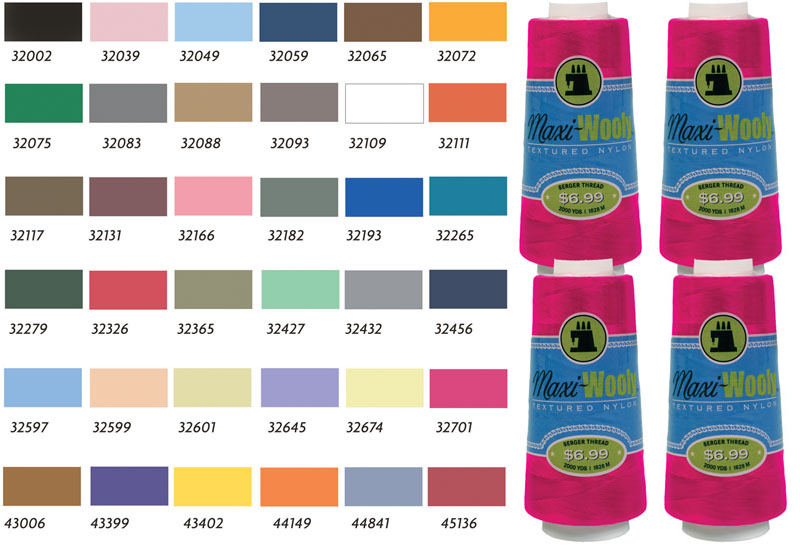 YLI Wooly Nylon Thread is ultra-soft and fully washable.